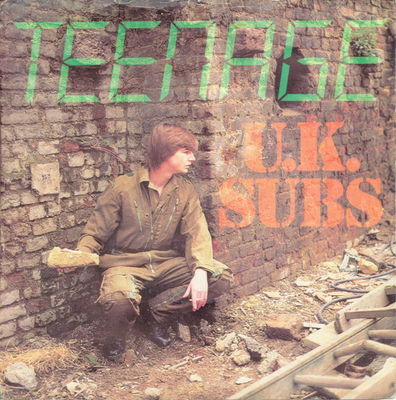 "You can be my Lambretta lover"
Above: Teenage UK release, 1980, front & back cover. The fifth single released on Gem and the last to feature the Slack & Davies rhythm section. Recorded again at Underhill Studios and produced by Nicky Garratt. 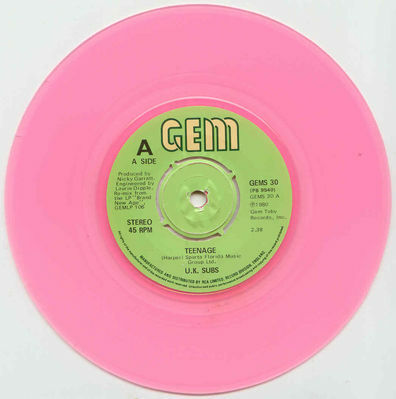 Teenage was a remixed version of the Brand New Age track backed by two new non-album songs. 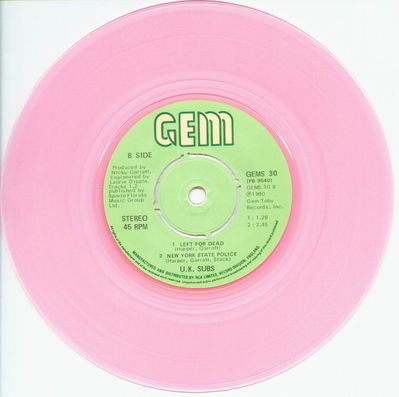 Top Of The Pops beckoned for the sixth time as the single entered the charts on the 17th of May 1980, hanging around for 5 weeks and reaching a high point of number 32 (Source: Guinness British Hit Singles 11th edition). 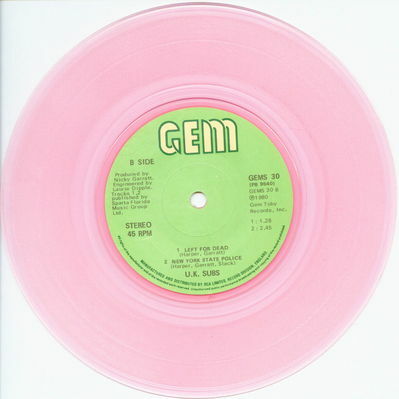 Nicky Garratt was so upset about the sleeve design (the Gem office tea boy in a 'Punk' pose), that he tried to throw the box with them in out of a window at Gem's offices. According to Daniela Soave's interview with the band that appeared in Record Mirror on 10 May 1980 "(the band) wanted a middle aged woman looking in a mirror, and there's a reflection of a young girl looking back at her." For the full interview and Pete Davies' other thoughts on the sleeve, click on the above link. 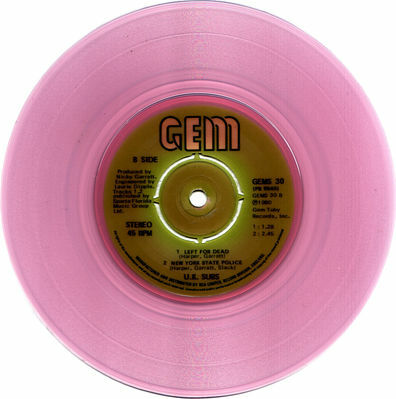 Pressed on pink vinyl with push-out and solid centres (solid centres don't have the teeth around the edge of the label that the push-out centres do), there are also a very small number of black vinyl copies with push-out centres with picture sleeves and GEM company sleeves. It would appear that the pressing plant that handled this single experienced problems with the labelling of the disc. 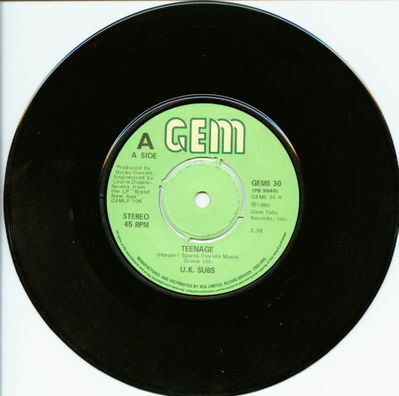 There are copies with two B Side labels printed one on top of the other, with the top label only loosely attached. Additionally, there is the mispressing pictured below. This has the B Side label printed upside down on the A Side of the disc, so that the white paper reverse is facing upwards. 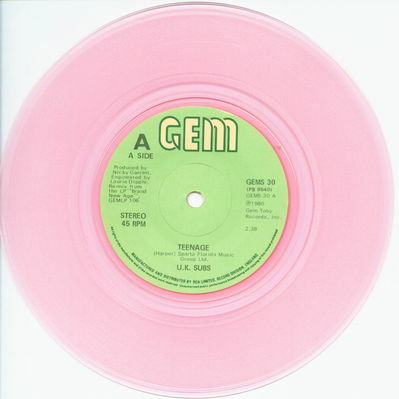 This makes a nice collectors item as the B Side label is visible through the clear pink plastic on the B Side of the disc, where, to add to the mispressing mistake, no label was put on. Basically it is an upside down label on the wrong side! If that all makes sense!! Above: Side A & B. Click images to enlarge. Various e-bay auctions have also turned up copies with no label on the A Side, or the centre part of the label missing (see images below). If you know of any other mispressed labels for this, or any other U.K. Subs release, please get in touch with the admins. 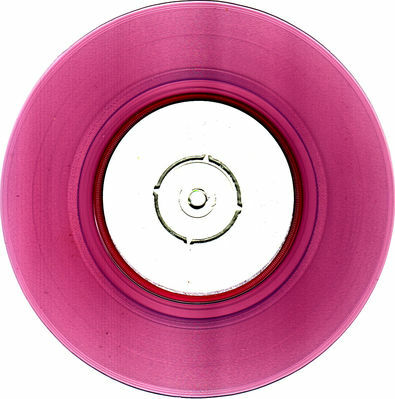 The above 'test pressing' appeared on e-bay in 2008. 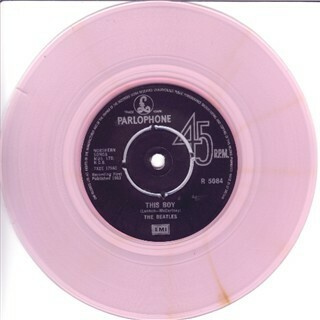 The following information accompanied the auction: "RARE UK 7" 45 PRESSED IN PINK VINYL. The B-side has THIS BOY labels from the 1976 Beatles re-issues. The A-side has a plain BLUE label with no text at all. 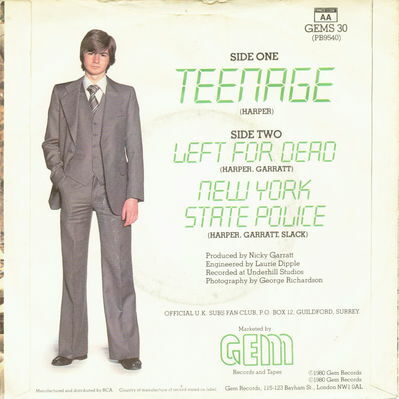 Both sides play UK SUBS tracks (TEENAGE / LEFT FOR DEAD / NEW YORK STATE POLICE). 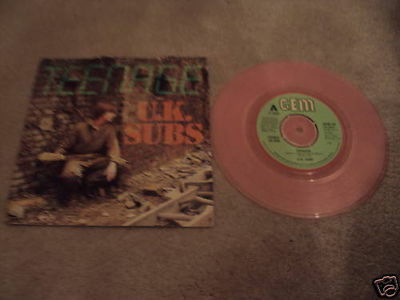 You can view it as a UK SUBS TEST PRESSING or a BEATLES label miss-press as both descriptions are accurate. Either way it's certainly a rarity." Above: Full page press ad, Music Week, 10th May 1980 page 27. Above: Teenage press ad, Record Mirror, 17th May 1980. Click to enlarge. Below: Slightly different ad from the same date, without the "The"! 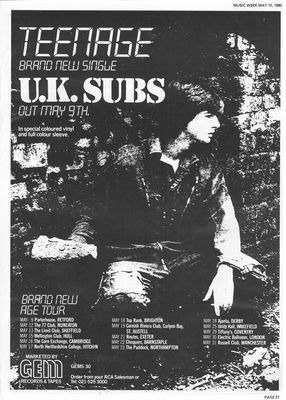 Above: Teenage Ad, Sounds, 17th May 1980, page 21. Click to enlarge.